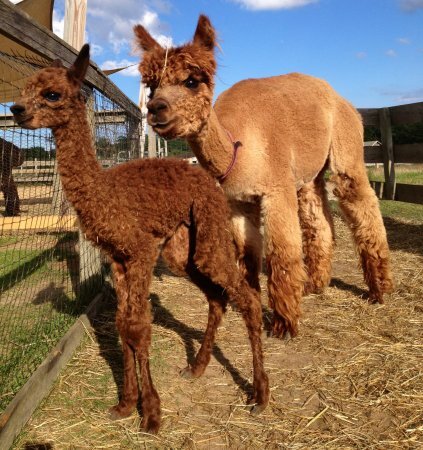 Atticus Rex won First Place at the Big E Alpaca Fleece Show and the Southern Select Alpaca Show Spin-Off in 2015! 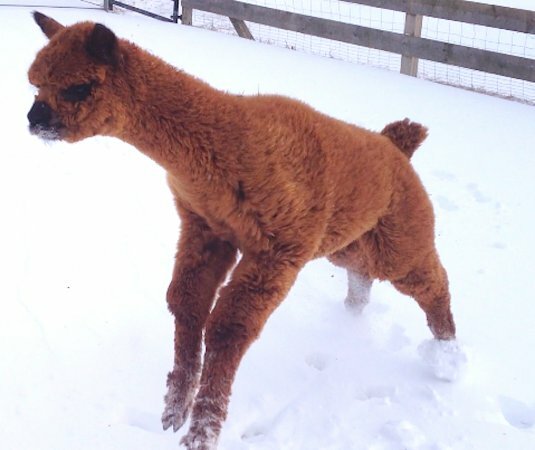 Atticus Rex and staff member Ashleigh Plante won Second out of 12 for the Adult Public Relations Obstacle Course at the North American Alpaca Show in 2014. 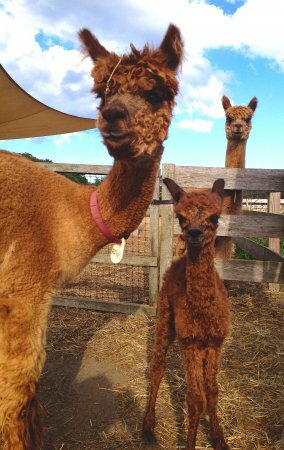 Together they also won Second out of 13 for the Adult Obstacle Course at the Big E Alpaca Show in 2017! Atticus Rex has nice lustrous crimped fine fleece with an amazing posture. He's a very curious and sweet male who's always interested in what's going on around him. Very well halter trained with a wonderful disposition, we take Atticus to many public events like parties, special events, and even to the hospital. His fleece quality is no surprise since his sire is CT Estrada who has won multiple champions and blues! Atticus has some fantastic genetics! His dam, Aftiel's sire is the famous CCNF Archangel who has won multiple ribbons from champions to blues to get of sire! His great grandsire is the well known Snowmass Nova who has also won many champions and blues. His line is just full of color! 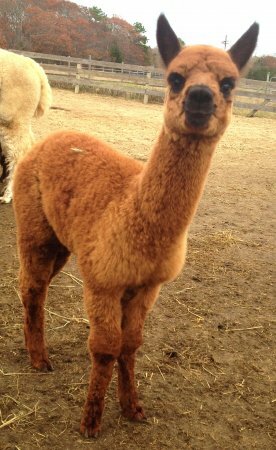 2016 Big E Alpaca Fleece Show judge Arturo Pena commented: "Good uniformity of micron, good brightness." 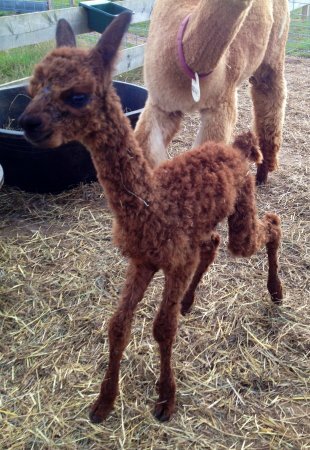 2016 Carolina Alpaca Celebration Spin-Off judge Kathy Klay commented, “Nice sample. Cards easily. Drafts evenly. Spins consistently. Versatile. Nice brightness. Nice end product." Fiber Highlights: 1st Impression, 5 out of 5. Absence of Guard Hair, 5 out of 5. Uniformity of Micron, 4 out of 5. Uniformity of Length, 5 out of 5 possible points. Spinning Highlights: Ease of Carding, 5 out of 5. Ease of Drafting, 8 out of 8. Ease of Spinning, 10 out of 10 possible points. Finished Product Highlights: Usability, 7 out of 7. Brightness/Luster, 5 out of 6 possible points. 2016 TXOLAN Spin-Off judge Roo Kline commented: "Nice silky handle, squishy! :) Consistent micron. Carded so very beautifully. Porduced such a lovely yarn!" Fiber Criteria Highlights: 1st Impressions, 4 out of 5. Uniformity of Micron, 4 out of 5 possible points. Spinning Criteria Highlights: Ease of Carding, 5 out of 5. Ease of Spinning, 8 out of 10 possible points. 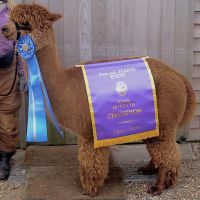 2015 Big E Alpaca Fleece Show judge Stephanie Glyptis commented: "Well organized fleece with good crimp definition as well as density and brightness to a high degree." Fleece Score Highlights: Micron, 7 out of 8. Length, 6.5 out of 7. Color, 4.5 out of 5. Character (Crimp), 8 out of 10 possible point. 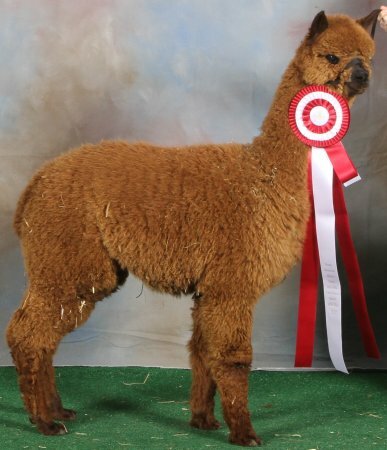 2015 Southern Select Alpaca Show Spin-Off judge Elizabeth Taylor commented: "Very silky, nice color. Really consistent." Fleece Score Highlights: 1st Impression, 4 out of 5. Absence of Guard Hair, 4 out of 5. Uniformity of Length, 5 out of 5. Uniformity of Micron, 4 out 5 possible point. Judge Wade Gease commented on his fleece, "Great Handle!" 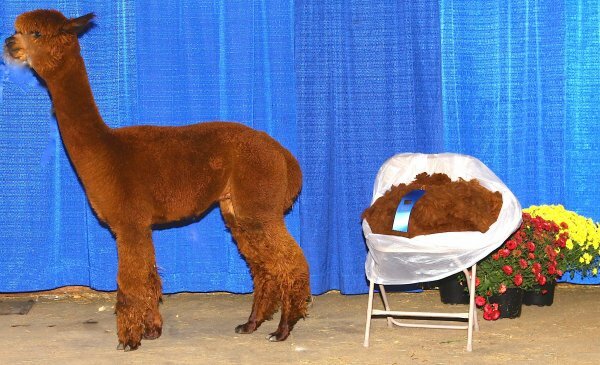 2014 A-OK Alpaca Blast Off Show - Judge Kathy Klay commented: "Good staple length for time of growth." Fleece Score Highlights: Length, 6.5 out of 7. Color, 4.5 out of 5. Brightness, 8 out of 10 possible points. Aptly named after the "Angel of Twilight" CCNF Archangel's Aftiel is one of the most stunning animals in the herd. 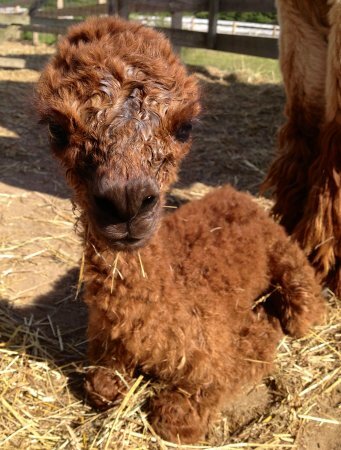 We would like to say that we think it doesn't get any better than this in color but we have not seen every colored alpaca in the US. But we reckon the phenotype, the pedigree, the fiber, it all stacks up here as being elite. 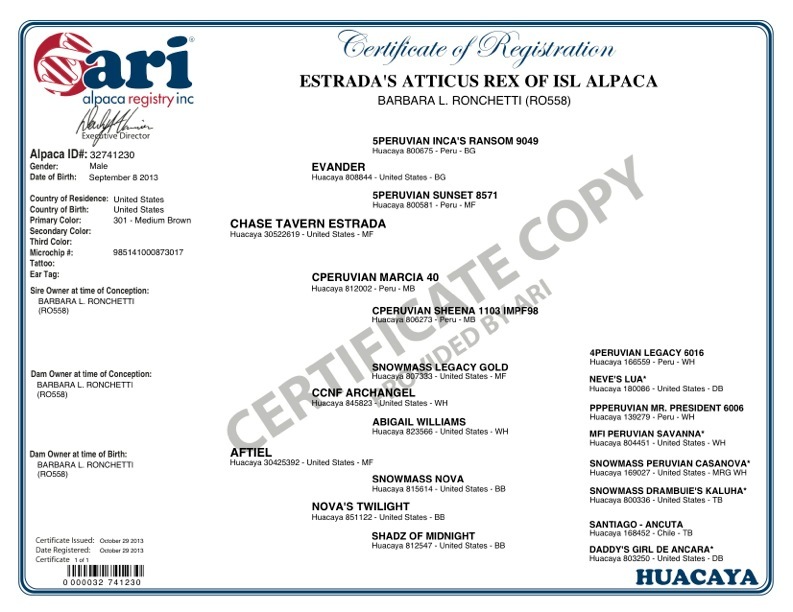 Speaking of lineage, Archangel's Aftiel, in October 2008, was one of the darkest offspring (only five medium fawn alpaca of 72) by her multi award-winning sire, CCNF Archangel (offspring of, Accoyo Legends, Snowmass Legacy Gold, PPERuvian Mr. President, and Augusto.) 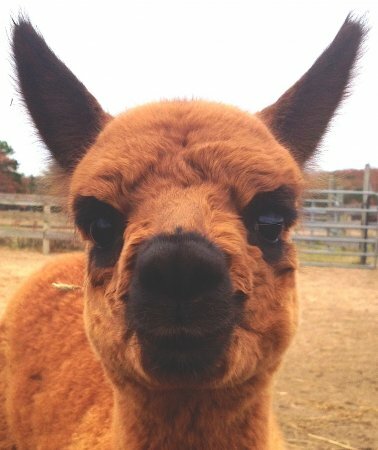 Only 25% of his registered alpacas have color. Aftiel has fabulous solid color! Her fleece is fine and dense exhibiting high luster, and staple. Her dam, Nova's Twilight, is a fabulous black with terrific presence and valuable heritage: Snowmass Nova and Snowmass Peruvian Casanova. Disregarding all of these wonderful traits, and genetics, there is something worth mentioning about her personality... she carries with her, most of the day, a piece of hay, or a stick in her mouth just for fun and often times she comes close enough and offers kisses to her human friends... 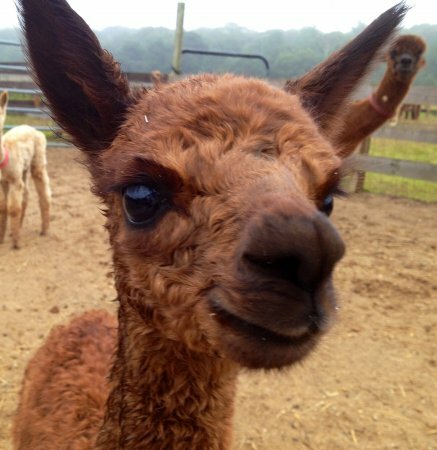 I have not yet met an alpaca with such endearing traits! 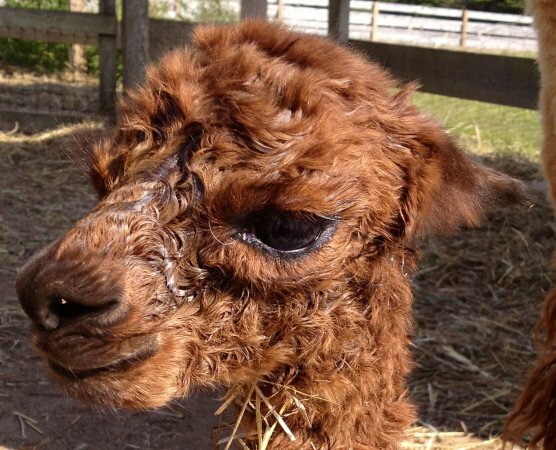 Don't miss out on your chance to own one of the first Archangel cria for sale!